City of Gold Coast Mayor Tom Tate has revealed the new masterplan for the Evandale Precinct with the new design by ARM Architecture. Speaking from the Council’s YouTube channel, Tate said that the $35 million Stage One development of the $305 million Gold Coast Cultural Precinct will commence in 2015. “The result is a finely tuned masterplan for Evandale; a blue print for a cultural destination for residents and visitors that can be developed as the city can afford it,” Mr Tate said. Stage One Development will be funded by the sale of council land and includes outdoor space, a riverside hub and artwork across the precinct. The design comprises of 11 hectares of geometric art-focussed facilities that surrounds Evandale Lake which is close to the city hub. The Masterplan describes designs for a modernised Living Arts Centre, Art Hotel and a 14 storey Arts Museum tower that will include bungee jumping facilities. It also includes space designated to retail and cafes. The design retained a 10 000 seat outdoor amphitheatre however this has since been replaced with an outdoor space named “The Splash”, providing a small enclosed stage. The Living Arts Centre continues to be regarded as the key feature of the design with a 1,200 seat theatre and a 350 seat black box theatre. ARM architecture was chosen for the redevelopment through a 2013 competition, to which 75 other firms entered. ARM Architecture Director Howards Raggatt said the design intended to blend into the surroundings. “We didn’t want to see art activities separate from other activities, we wanted to see them all as a part of human culture,” Mr Raggatt said. 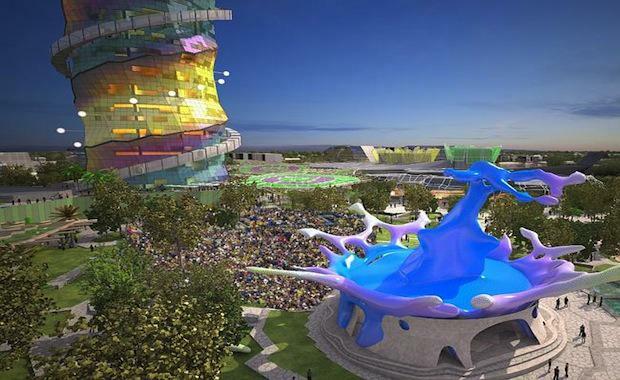 The precinct is expected to be complete in time for the 2018 Gold Coast Commonwealth Games.